The Potential Economic Impacts of the Mariner East Pipelines | Econsult Solutions, Inc. In 2015 Econsult Solutions, Inc. (ESI) estimated the economic impact of Sunoco Logistics’ Mariner East project based on the then under construction Mariner East 1, the proposed Mariner East 2 and the associated upgrades being made to the Marcus Hook Industrial Complex (MHIC). Since that time, the potential economic impact has substantially increased due to several changes to the Mariner East project scope and the introduction of an additional phase. 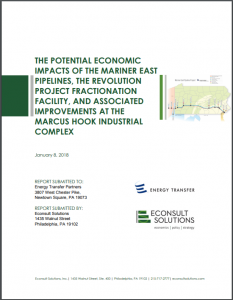 Due to the significant expansion of construction and operations associated with the Mariner East pipelines, MHIC, and the Revolution Project at the MHIC, ESI was commissioned by Sunoco Pipeline, L.P. and its parent company, Energy Transfer Partners, L.P. to update the economic impact study to reflect the changes in project scope. The construction of Mariner East projects is estimated to generate a potential one-time economic impact of nearly $9.1 billion in the Commonwealth. Construction will support 57,070 direct, indirect and induced jobs between 2013 and 2019 with earnings of $2.7 billion impacting multiple industries. Construction expenditures will generate estimated one-time tax revenues of $122 million to the Commonwealth over the length of the construction period from the direct, indirect, and induced economic activity. By 2020 the Mariner East projects, the fractionation facility and the associated improvements at MHIC will produce between $140 and $210 million of ongoing annual economic impacts in the Commonwealth, supporting between 360 and 530 jobs direct, indirect, and induced jobs with earnings between $30 and $45 million. In addition, the report provides insights into the evolving energy landscape in Pennsylvania and the rise of natural gas liquids (NGLs) such as butane, ethane, and propane, whose production has increased and is forecasted to continue to increase in the U.S. It projects that the expansion of the Mariner East pipelines and the introduction of the Revolution Project will boost the transportation, storage, and distribution capacity of NGLs in southeastern Pennsylvania, creating a supply for home and commercial heating as well as manufacturing and industrial feedstocks. ESI Updates the Economic Impacts of the Mariner East Pipelines Sunoco Logistics Mariner East Economic Impact Report Employment in Construction: Where are the Skilled Workers?